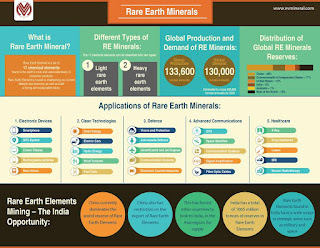 Mumbai, July 20, 2016: With an intent to educate our audiences on what Rare Earth Minerals are, what is the percentage of these minerals in India and the usage of these minerals, we have created an infographic. It will give you a perspective of the industry, it’s scenario in India and how it can help various industries and boost the country’s economy. The process of mining and it’s applications can very well be a part of Hon’ble Prime Minister Shri Narendra Modi’s #MakeInIndia campaign that talks about India being the manufacturing hub. 1. India accounts for 11% of global beach sand mineral deposits? These minerals are scientifically categorized as Rare Earth. 2. Currently India has a coastline of 7,500 kms. Our deposits contain heavy minerals like ilmenite, rutile, garnet, monazite, zircon, and sillimanite.